Today is day the start of my vacation. Well, it was at 3:30pm when I logged out of the phone system and enabled the "out of office" message in Outlook. I won't have to log back into my work computer for 12 days. My son lives in Denver. He is purchasing my mom's car (basically, paying back his uncle for the price he paid for my mom's funeral). So to get it out there, we (my wife, daughter and myself) are driving the car from Illinois to Denver. Fourteen plus hours - we'll do it over two days. We plan to leave Friday and head for Des Moines. Hit the Bob Feller Museum, stop at some zombie burger joint, then drive to somewhere in Nebraska to crash for the night. I have heard Nebraska is a whole lot of nothing, so I plan to break that up over a couple days. Then into Denver on Saturday. On the agenda is a Rockies game Monday night. After that, no real set plans. If anyone in the Denver area and wants to meet up, send me a DM via Twitter and we'll talk. Well, before I leave, let's do two things: a) set up a few scheduled posts, but mostly b) clear out the scanned folder. When I come home on Saturday the 28th, I want to come home to a clean house, and a clean scan folder. So here goes. These three came from Shane at S.Mack Talk. After we did a trade, I noticed his want list and sent a few that I had via PWE. His return were these three needs from my 2013 Update list. I got Hoyled by Mark (again). 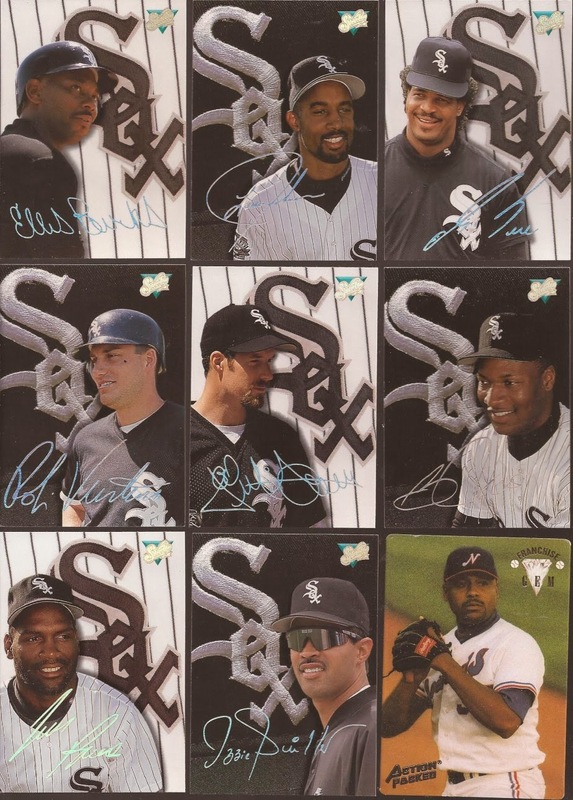 Along with a nice '64 I forgot to scan was this bevy of ChiSox Studio cards, and the oddball Action Packed a the lower right. Plus in there were these three cards. Two for the DP binder, but that center card was interesting. After some research, is is from a 1990 Broder set. You couldn't ask for a plainer front, or back, than this group. Thanks as always, Mark. I am putting together a bunch of BoSox for you. Matt from Cardboard Conundrum ran a hockey box break. I was able to score my Hawks, plus had the Oilers and Sharks as my randoms. Here are the only two Hawks from the boxes, plus my Sharks hit from the In The Game Enforces set. The Kane is # 30/100 so I am pleased with that. 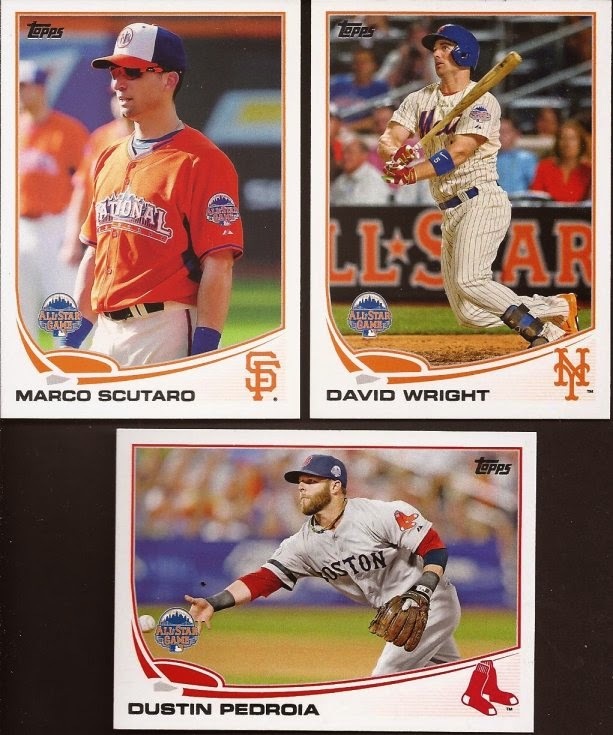 Three card PWE from Pat at Hot Corner Cards. One for the DP binder and these two South Siders. 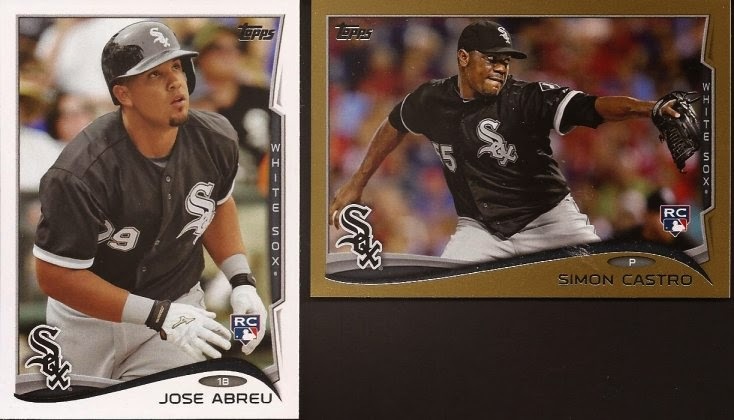 Castro gold and some kid named Abreu. I hope he does something for the White Sox. "Newest oldest bunter?" was the note with this gorgeous '54 Bowman courtesy of Matt from Once A Cub. Since he asked it as a question, I will answer - yes. Thanks a million for this beautiful entry in the binder. Ok - all empty now. Granted, I have a stack from TribeCards 2013 Pack a Day I need to showcase, but they are not scanned, so I got time. Drive safe Jeff, enjoy the time away! Enjoy the trip and be sure to check out the Red Rocks Amphitheater while you are in Denver (if you've never been before). One of my coolest trips involved going to Denver, meeting up with a friend, and going on stage at Red Rocks just to see the view up. I have family out in Denver and have done a little recon on the card shop front. The best I have found is Bills' Sports Collectibles located at 2335 South Broadway in Denver, 80210. Last time I was there the streets were under construction. Yuck. It's a solid store though: everything from vintage, to modern, to starter sets, to boxes, to scorecards and other memorabilia. 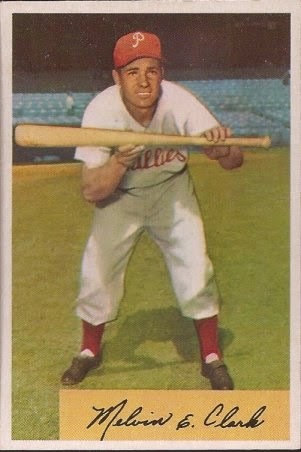 When's a PWE not a PWE?